An effective resume is the 3key to land a great interview. Still, people are careless about it, designing it poorly and proofreading it. Recently, hiring managers and recruiters have said that the current batch of resumes they have seen is the worst. From spelling to designing mistakes, they have seen it all. How do you create a resume that your employers love? I have some tips for you that will increase the chances of HR picking up your resume. An HR/ employer usually spend 25 seconds scanning your resume. If it is poorly formatted, they won’t pick it up for a thorough reading. Also, most companies have an electronic scanner, and it skips CVs with bad and unreadable fonts. Use bold and italic typeface whenever necessary. Also, use bullet points for important data like achievements. Hiring managers are looking for candidates that can help them solve a problem within the firm. Also, they look for people who can help companies need. For this, you need to show them how you solved similar problems or were an asset to your previous employer. Explain what duties and roles you performed in your old job. Before listing your accomplishments, describe your job in one or two lines. A resume is created to market the candidate, not the job or industry. So, don’t make the job description too generic or use technical jargon that sells your job. Instead, use words and description that talk about your achievements. Quantify your achievements so that it catches the eye of the employer. You have to design your resume according to your industry. If you are sending out a resume for an engineering job, you can design a stylish CV. It should be informative, neat, crisp and error-free. It should not have different fonts, color or so on. Similarly, if you are from advertising or designing background, a little creativity will help you. An objective sounds too generic- Seeking a job to learn and contributing to the firm using my skills. It sounds vague and it doesn’t go for every job. Instead of this, write a career summary or job description. Under this heading, you can talk briefly about yourself and what you did or can do.Remember you only have limited seconds to make a great impression. And managers look at the career summary for scanning numerous resumes.Also, all the things you write should be accurate and powerful. Know more about it here. Networking will help you get a great recommendation on paper and impress your recruiters. Having a great, effective and solid resume increases your chances of getting a job. Tools like Canva CV maker can help you design an amazing resume within minutes. 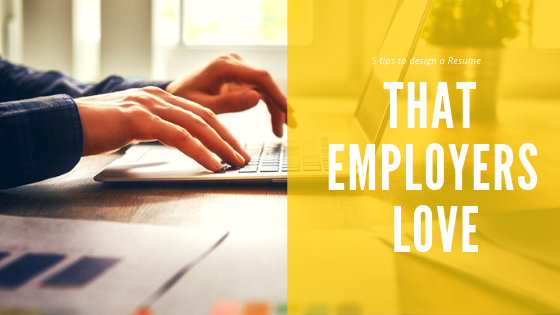 But whatever you do, make sure to follow these tips as they will greatly help you to find a job that you love.